Isaac Julien has made a career forging his own path in unchartered territory at opposite ends of the earth, beginning in London’s East End where he first befriended other artists and filmmakers making politically charged work in the 1970s. It was there that one day he stumbled into a studio and witnessed a performance piece by an artist he would later realise was Stuart Brisley, who lay in dark room submerged in a bath of black ink for approximately two hours each day for two weeks next to piles of rancid, fetid offal [And for today… nothing]. It was during a four year stint studying painting and fine art film at Central Saint Martins that Julien says he made his first serious work, Who Killed Colin Roach?, a film about a young black man who died under mysterious circumstances in a police station in North London. After making a second experimental documentary exploring the tension between black youth and white authorities at Notting Hill Carnival called Territories, Julien says he fell into a Sankofa, a black video film collective intent on pushing questions around sexuality and gender in their work until it disbanded in 1992. The year prior, Julien’s film Young Soul Rebels won what he calls “a small prize” [the Semaine de la critique prize] at the 1991 Cannes Film Festival – the first of many many major accolades in his career. Today, Julien is one of Britain’s most influential, and critically acclaimed artists. The Turner-prize nominated artist’s pioneering multi-screen video installations and photographic works appropriate the signifiers of luxury to create immersive set pieces that interrogate global geopolitical issues. Through the powerful marriage of sound and vision, Julien’s poetic narratives reflect those of change and crisis, tracing the cartographies of displaced persons, documenting transformative cultural exchanges and confronting audiences with the fragility of nature’s economy. Back in Australia in occasion of the unveiling of his most recent work at Roslyn Oxley9 gallery, and Julien is more intent on looking forward than reflecting on his past. It’s an interesting paradox considering his new exhibition Refuge posits a work created in 2007, WESTERN UNION: Small Boats, against one of his most recent works, Stones Against Diamonds. It’s the first time the two works have been shown together, with the earliest work making its Sydney debut having previously been shown at Brisbane’s GOMA and at Monash Museum in Melbourne. 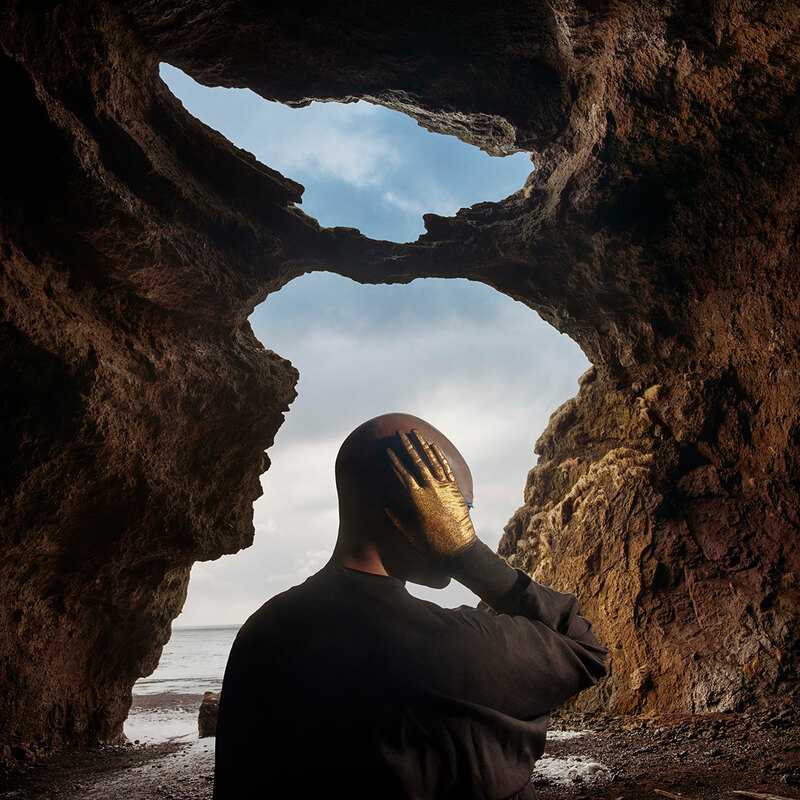 Exhibited alongside each other, the two works take on an especially pointed meaning for Australian audiences when you consider their thematic concerns: the migration of displaced people seeking refuge in inhospitable climes. A conceptual link between the two works comes courtesy of a shared protagonist in Vanessa Myrie, whom Julien met in the early aughts through her work in film production. In THE LEOPARD, a single-screen version of WESTERN UNION: Small Boats, Myrie plays a kind of enigmatic witness character to the migrants who travel by small fishing boats contrasted with lavish baroque interiors, brocade tapestries and chandeliers of Italy’s Palazzo Gangi. THE LEOPARD forms the final instalment of Julien’s trilogy about transcontinental migration that also includes True North (2004) and Fantôme Afrique (2005) and meditates on the journeys people make each year in order to escape war and famine. Myrie’s presence as a protagonist links Stones Against Diamonds with WESTERN UNION: Small Boats, which is a work that takes the idea of refuge into a more contemporary understanding of what that might signify versus the more poetic exploration of the former, wherein the wilderness of Iceland and the isolated ice caves of Europe’s largest glacier become both a place of refuge and a metaphor of the unconscious. 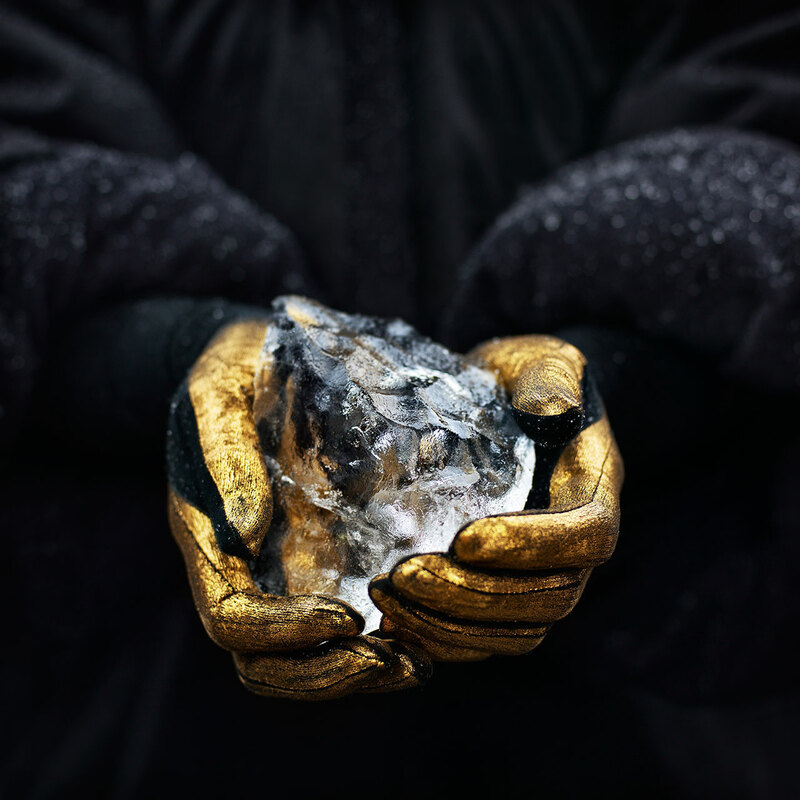 Stones Against Diamonds is Julien’s third artistic venture into Iceland, following on from True North’s meditation on a black explorer called Matthew Henson who went to the north pole with Robert Peary in 1909 and PLAYTIME’s (2014) exploration of the Global Financial Crisis across three countries. An interest in returning to the locations where he’d previously made work coincided with Julien’s growing interest in the life and work of an Italian Brutalist architect called Lina Bo Bardi. Julien discovered the modernist’s work when he was invited to participate in a 2012 exhibition at SESC Pompeia [VideoBrasil, in São Paulo], an art centre that Bo Bardi herself designed. By showing his work in Bo Bardi’s space, Julien says he became fascinated by her – a fascination that was compounded when he again was invited by Hans Ulrich Obrist to exhibit in Bo Bardi’s famous glass house in São Paulo. Stones Against Diamonds then takes its title from a particularly poignant letter that Bo Bardi wrote in reply to her husband’s desire to give her jewellery. The shoot itself was initially expected to take five days, and instead took Julien’s 50-person crew on a much longer 643 kilometre voyage across the Vatnajökull glacier in -30° temperatures – the extremity of the conditions only adding to the potency of the work’s concerns. 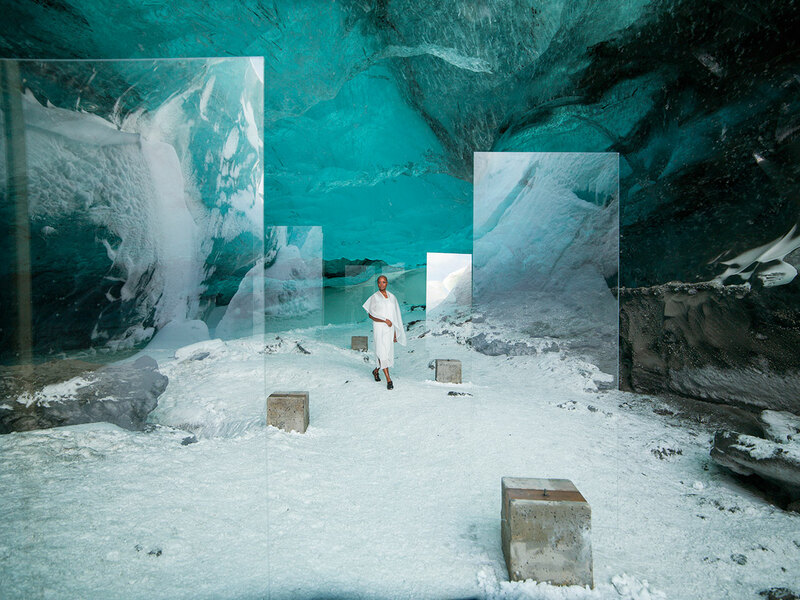 In Stones Against Diamonds, Myrie plays another kind of spectral figure clad in custom made Issey Miyake and Yohji Yamamoto as she moves throughout the spectacular architecture of the glacier. The poetry of the piece is clear: the world’s most beautiful objects can’t be valued in conventional terms, and our truly precious places – worth more than diamonds – are being destroyed beyond repair. In relation to another extremely prophetic work like WESTERN UNION: Small Boats, questions around migration and climate change and their prominence in international debates are brought to the fore. Julien insists, however, that these are more poetic responses to these concerns, rather than polemical ones. Ultimately, Julien says that Stones Against Diamonds is merely an introduction or a prologue to the work that he wants to make about his new muse, Seven Songs to Lina Bo Bardi. That next body of work will take both photographic and filmic form as it retraces the steps of a woman who Julien considers to have spent a life fighting fascism – an experience the artist considers to be very interesting for audiences today, at a time “when things are not quite right”. 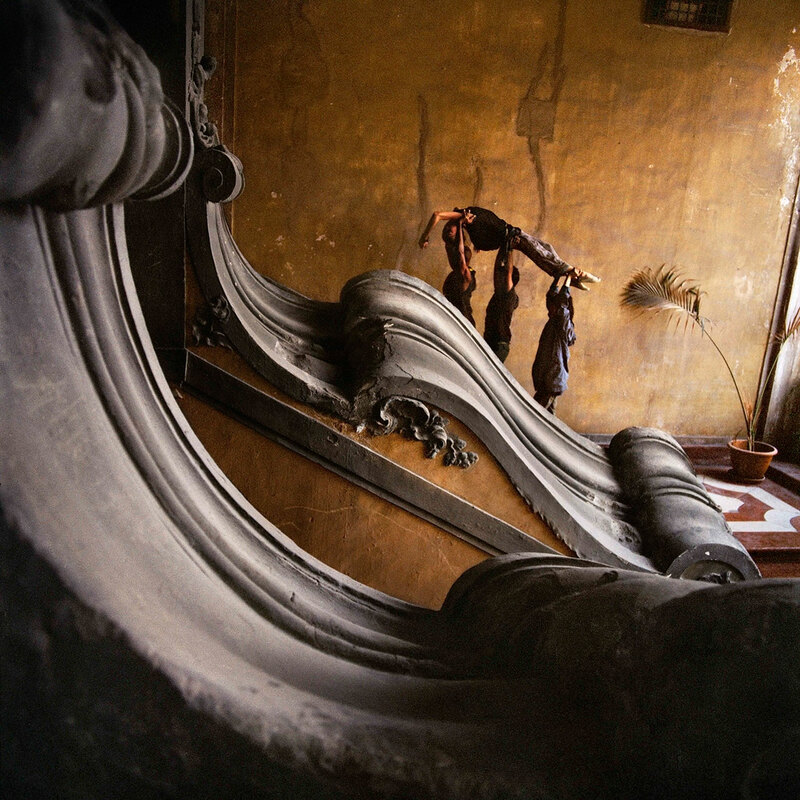 Isaac Julien, Refuge, is open at Roslyn Oxley9 until November 19. More information is available here.